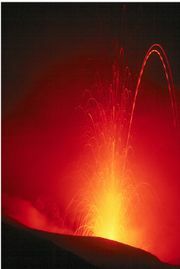 Volcanic activity comes in many different forms, from trickles of lava to violent explosions that shoot rocks, ash, and gas hundreds of feet into the air. The latter type, often called "plinian" eruptions, can be as powerful and destructive as any nuclear weapon, but all types of volcanic eruptions are dangerous. Fortunately, most volcanoes are carefully monitored, and scientists can usually provide some advance warning before a serious event. That said, if you live near a volcano or get an opportunity to visit one, you are always at risk. As is the case with most natural hazards, however, a little knowledge and preparation can help you escape an eruption alive. If you live in the vicinity of a volcano, make preparations well in advance. If you reside in the shadow of a volcano, you should always be ready for an eruption. Learn what kind of eruption is likely. You will need different strategies to deal with different kind of eruptions. Stock up on necessities. Store at least a three-day supply of food and potable water at your home. In the event of an eruption, water supplies may become contaminated, so you can’t count on your well or public water. Keep a first aid kit, blankets, and warm clothing handy, and have a battery-powered radio and fresh batteries on hand so that you will be able to listen to advisories if the power goes out. Keep necessary medications together. Ideally, you should keep all these things in one place—a large container that you can carry, for example—so that you can quickly bring them with you if you need to evacuate. If you will be visiting a volcano, knowledge is your most important protection. Before going to the volcano, consult with local authorities, and heed their recommendations or warnings. Learn about the hazards you may encounter in the area of the volcano, and get a reputable guide to accompany you, if possible. Bring plenty of water in case you become unexpectedly trapped by a lava flow, and don’t overexert yourself. You’ll be able to react more quickly—and run for your life, if necessary—if you’re not fatigued. Listen for radio or TV advisories when an eruption occurs. When a volcano erupts, immediately tune in to determine if you are in immediate danger where you are and also to find out what is happening around you. These advisories will be your “eyes” to see the larger picture and help you assess the situation and make the right decisions. Leave the area promptly if told to do so. You may be ordered to evacuate wherever you happen to be or, in some cases, evacuation may simply be recommended. Either way, get out. In recent eruptions, many people have been killed because they did not heed an evacuation order. If you are lucky enough to get advance warning, use it wisely. Conversely, if you are not instructed to evacuate the area, stay where you are unless you can see immediate danger. Taking to the roads may be more hazardous than staying at home. Get to high ground. Lava flows, lahars, mudflows, and flooding are common in a major eruption. All of these can be deadly, and all of them tend to travel in valleys and low-lying areas. Climb to higher ground, and stay there until you can confirm that the danger has passed. Protect yourself from pyroclastics. While you want to get to higher ground, you should also try to shield yourself from pyroclastics which are rocks and debris (sometimes red-hot) that are sent flying during an eruption. The most important thing to do is watch out for them and get out of their range. 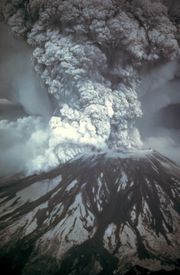 Sometimes they actually rain down, and in some types of eruptions, such as that which occurred at Mount St. Helens in 1980, these missiles can land miles from the volcano’s crater. Protect yourself by staying below the ridgelines of hills and on the side of the hill opposite the volcano. If you are caught in a hail of smaller pyroclastics, crouch down on the ground, facing away from the volcano, and protect your head with your arms, a backpack, or anything else you can find. Avoid breathing poisonous gases. Volcanoes emit a number of deadly gases, and if you are close to one when it erupts, these gases could kill you in less than a minute. Breathe through a respirator, mask, or moist piece of cloth—this will also protect your lungs from clouds of ash—and try to get away from the volcano as quickly as possible. Do not stay low to the ground, as some of the most dangerous gases are heavier than air and accumulate near the ground. Get and stay inside. Unless you need to evacuate, the safest place you can be is inside a strong structure. Close all the windows and doors to protect yourself from ash and burning cinders. Receive medical treatment promptly for burns, injuries, and gas/ash inhalation. Once you are safe, waste no time to get treatment or an examination. Keep in mind, however, that you may need to wait a while if there are people with more serious injuries. Respect the power of a volcano. Some blasts can absolutely devastate an area many miles wide within hours or minutes. Driving through heavy ash is dangerous. Visibility is impaired, the roads may become slippery, and the radiator may become clogged. Keep your headlights on, proceed slowly, and watch your car for overheating. You can almost never outrun a lava flow or lahar, but you may be able to dodge it by getting out of its way, especially by climbing to higher ground. If you live near a volcano, don’t wait for an eruption to prep are your emergency supplies and contingency plans. You should make a plan as a family, so that everyone knows what to do and where to meet up. Before traveling to a volcano, learn as much as you can about what you’ll encounter there, even if you will have an experienced guide. Not only will you gain a better understanding of these fascinating phenomena, you will also be better prepared to avoid danger and respond appropriately if an eruption occurs. Watch out for signs of fire if you are indoors. A red-hot pyroclastic can ignite a roof fairly quickly. Beware the danger of roof collapse if heavy ash accumulates. Clear the roof of ash periodically, as several feet of ash can fall in a few hours. Never try to cross a lava flow or lahar. Even flows that appear to be cooled may simply have formed a thin crust over a core of extremely hot lava. If you do cross a lava flow, you run the risk of being trapped between flows if another suddenly develops. Don’t try to cross geothermal areas. Hot spots, geysers, and mudpots are common on volcanoes. The ground around these is typically very thin, and a fall through could result in serious burns or death. Never try to cross these during an eruption, and otherwise cross them only on safe, marked paths. Mudflows and flooding following an eruption generally kill far more people than pyroclastics or lava. You can be in danger even many miles from the volcano. The most devastating effect of volcanic ash comes from pyroclastic flows. These occur when a volcanic eruption creates an "avalanche" of hot ash, gases, and rocks that flow at high speed down the flanks of the volcano. These flows can be impossible to outrun. As well as being impossible to outrun, they are almost as difficult to predict. In many cases prediction has been based on the topography of a region, only to see a valley fill and overflow. In 1902, the city of St. Pierre in Martinique was destroyed by a pyroclastic flow which killed over 29,000 people. Volcanic ash (by itself) is not poisonous, but inhaling it may cause problems for people whose respiratory system is already compromised by disorders such as asthma or emphysema. The abrasive texture can cause irritation and scratching of the surface of the eyes. People who wear contact lenses should wear glasses during an ashfall, to prevent eye damage. Furthermore, the combination of volcanic ash with moisture in the lungs can create a substance akin to liquid cement. Therefore, people should take caution to filter the air they breathe with a damp cloth or a face mask when facing an ashfall. Ash is very dense, as only 100 millimetres (3.9 in) of ash leads to the collapse of weaker roofs. A fall of 300 millimetres (12 in) leads to the death of most vegetation, livestock, the wiping out of aquatic life in nearby lakes and rivers, and unusable roads.Accompanied by rain and lightning, ashfall leads to power outages, prevents communication, and disorients people.